Form: Very characteristic. 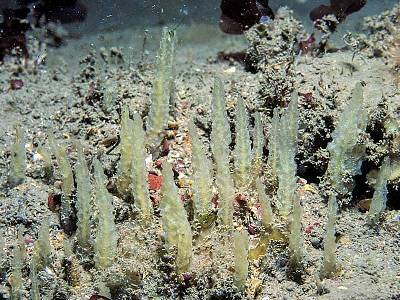 The sponge consists of a basal cushion buried in sand or gravel, from which project large conical, translucent, ridged, thick walled, non-contractile papillae. Smell: ? None (please check smell and report). Surface: The surface of the papillae has a glassy, translucent appearance, through which vertical spicule fibres can be seen with the unaided eye. A central core is usually conspicuous in living material. These are responsible for the vertical ridges. Apertures: Oscules are on top of some of the papillae (which are therefore exhalent processes as well as inhalent - this contradicts the first edition of the photograph captions). 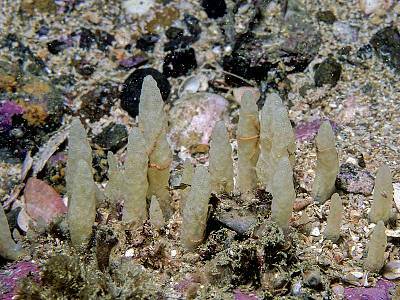 The oscules can be seen only when the sponge is undisturbed underwater. Skeleton: Halichondroid. The main skeleton is an irregular reticulation consisting mostly of larger spicules, with a tendency to form ascending fibres. In the papillae there is a central condensation with radially arranged ascending fibres. The ectosomal skeleton is a tangential reticulation (sometimes very diffuse), with smaller spicules predominant. ?There may be sub-surface spaces . Spongin is scarce. Spicules: The spiculation is simple: smooth megascleres consisting of large and small slender oxea and styles. The styles (a) are incompletely differentiated into two size categories, 300-(370)-425µm & 500-(550)-610µm, and the oxea (b) 470-(550)-630µm. The spicules frequently have telescoped or distorted extremities. There are no microscleres. Habitat: In clear water. 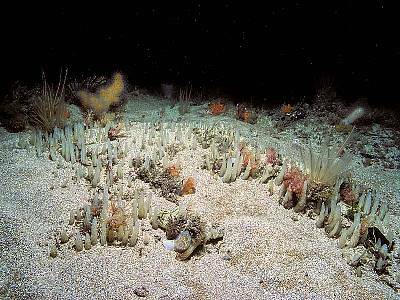 Always with basal cushion buried in sand or gravel which may be covered by a layer of silt. The usual habitat of clean coarse sand with some gravel indicates a preference for a degree of exposure to wave action or tidal streams. Distribution: "European seaboard of Atlantic from Heligoland south to Spain, Portugal, Mediterranean, etc" Known recently from Coll & Tiree; Lundy; Skomer; Wexford; Donegal. Identity: May be confused with Polymastia, Eumastia and other papillate genera. The larger size and thick ridged walls of the conical papillae, some of which break if bent, and their glassy look, are very helpful features once learned. Also the papillae of Ciocalypta do not appear to contract or collapse as do those of Polymastia spp. 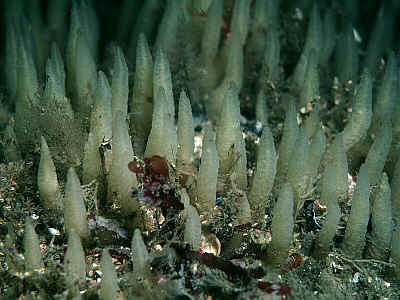 In Polymastia mamillaris a network of spicule fibres can often be seen underwater in the papillae. The spicule fibres in the papillae of Ciocalypta are central and vertical and do not form an obvious net, but appear as a central core. Pseudaxinyssa digitata is a similar species living in the same sort of habitat but currently known only from the French side of the English Channel, and the Mediterranean Sea. It has lateral digitations on the much larger papillae. Voucher: BELUM : Mc548. Saltee Islands.